The combination of heavy rain and high winds in parts of the region could cause trees and branches to hit overhead lines, bringing wires down and knocking customers out of power. Multiple days of rain can soften the ground, making it more likely that some trees may fall. Anyone who sees downed wires should stay away from them, as they may be live. Play Button_69Do not touch downed wires with your hands or any object. Be aware that downed wires can be hidden from view by leaves, tree limbs or water. 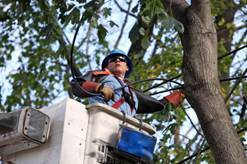 Customers can report service problems and restoration status at www.conEd.com or by calling 1-800-75-CONED (1-800-752-6633). When reporting an outage, customers should have their Con Edison account number available, if possible, and report whether their neighbors also have lost power. Click here to see a video on the restoration process. Depending on the severity of storm damage, crews will give priority to restoring service lines that will provide power to the most customers as quickly as possible, then move on to restore smaller groups and individual customers who are without power. Customers can also download Con Edison’s free iPhone and Android app, My conEdison, to report and check the status of a power problem, and view the company’s interactive online outage map. · Report all downed wires to Con Edison and your local police department immediately. · If a power line falls on your car while you’re in it, stay inside the vehicle and wait for emergency personnel. · If your power goes out, disconnect or turn off appliances that would otherwise turn on automatically when service is restored. If several appliances start up at once, the electric circuits may overload. · Check to make sure your flashlights and any battery-operated radios or televisions are in working order. Make sure you have a supply of extra batteries.